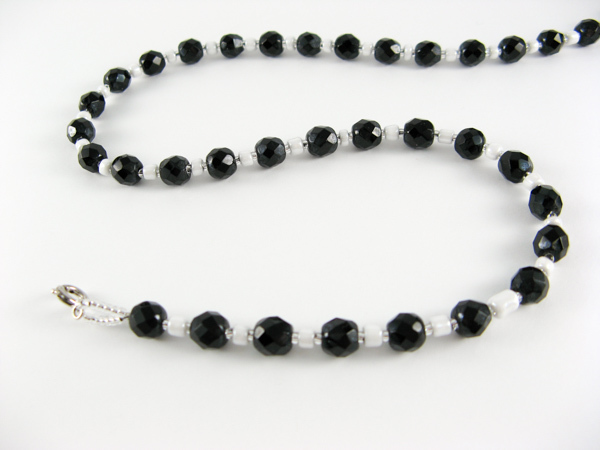 This is an easy to make black crystal necklace with pearl glass E Beads. My mother-in-law gave me a box of jet black fire polished crystals and asked me to design a simple 27" long necklace. This is what I came up with. She didn't want anything too fancy. Step 1: Center one black crystal on your beading wire. String one seed bead, one E bead, another seed bead, and one black crystal. Repeat this pattern on each side. Step 2: To add the clasp string one crimp bead, seven seed beads, the clasp, and seven seed beads. String the end of the beading wire back through the crimp bead and the first black crystal. Pull gently to tighten. Crimp the crimp bead. Snip off the tail of the bead wire. Step 3: Repeat step 2 with the other half of your clasp.